Prepare a cookie sheet with parchment paper. Add a thin layer of oil (sprayed on) to paper. In a bowl mix the almond meal, flour, and spices. Add the olive oil and work in with a spoon or your fingers until evenly distributed. In another bowl, pour the egg whites. Take the chicken strips and coat them in the egg whites. Then, one by one, dip them in the almond mixture pressing each side to coat. 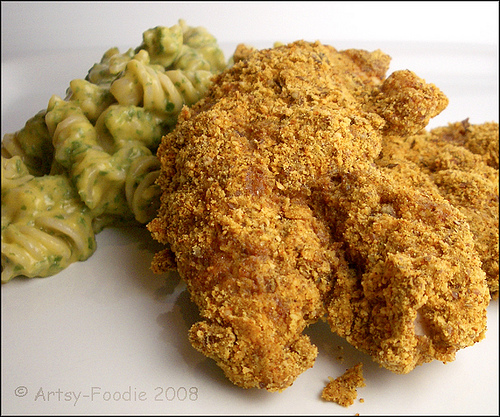 Place the crumb coated chicken strips onto the prepare cookie sheet. Spray some olive oil on top of the strips. Place in the oven to bake for 15-20 minutes. Chicken strips are cooked inner-temperature reaches 160F when checked with a meat thermometer. Keep an eye on it to avoid burning and to keep the chicken moist. Serve with your favorite dip.